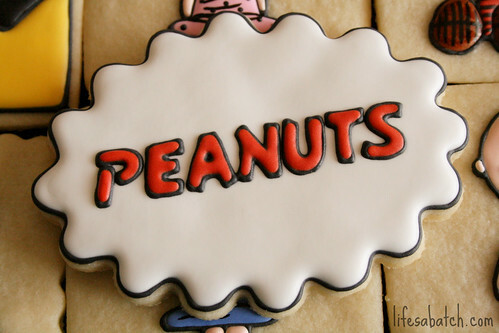 Remember Peanuts? 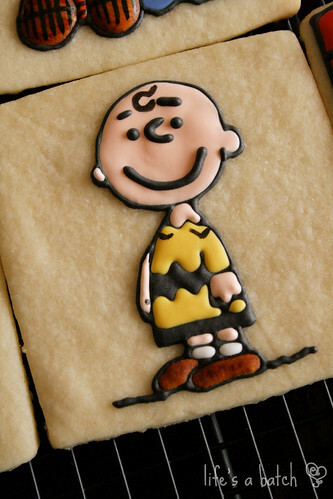 Nope, not the kind you eat – the lovable characters from dear ol’ Charles Schulz! 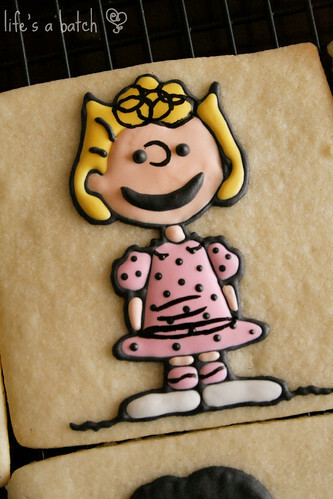 And, I suppose, when you draw his characters on a sugar cookie… then yes, you CAN eat them! 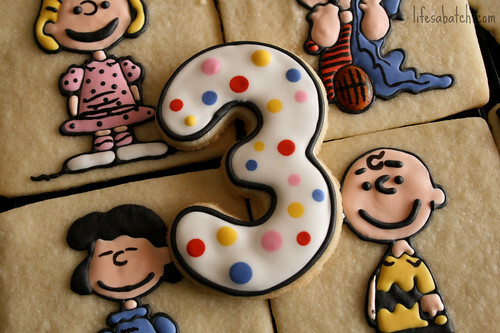 My friend Jessica’s little Fletcher was turning 3, and he chose the cutest theme. I couldn’t wait to surprise her with these cookies! And because she didn’t know they were coming, I had to take a guess at which characters & such to make. I knew Snoopy would be important, of course. And Snoopy hardly goes anywhere without his best buddy, Woodstock. 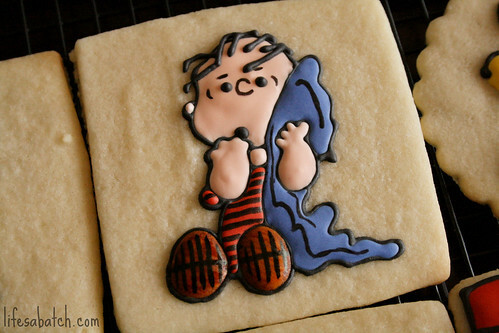 I know that red, stripey cookie up there *almost* resembles Snoopy’s doghouse for a moment. It isn’t. That is one of four “easier” cookies I made, and the inspiration for those comes directly from Bridget, over at Bakeat350. You see, she made these cookies a few months back, and I knew they would make perfect fillers for Fletcher’s set of cookies. Thanks for the great idea, Bridget! 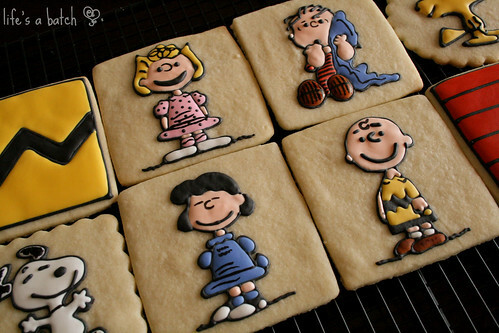 I remember reading old Charlie Brown comic books when I was really young. Most of the comic books were about the same size as a typical paperback these days (nothing like the glossy magazine styles found today), and the ones my older sister and I read came from my Uncle James’s old collection. The books were falling apart, and I “restored” them by making new covers out of paper grocery bags. For a summer, my sisters and I added sleeves & library “check-out” cards to each book, too. If you were to walk into my parents’ house right now, you’d still find those re-covered paperbacks, and you could probably still “check” one out, so long as you signed the index card inside. Every Sunday, I looked forward to reading the new strip in the colored “funny papers.” I had to wait until my dad was finished with them first, but I usually was scrambling for second dibs! And when I first heard that Charles Schulz was retiring from his penning his comic strip due to health problems, I was so sad to see the end of a part of my childhood. We were stationed in Alaska at the time, and I made sure to stop at a newsstand on my way to work that cold, February day. I wanted to make sure I had a copy of the last Peanuts comic strip. Hours later, I held that strip & shed a few tears as I heard that Mr. Charles had died the very same day. This was such a sweet post! 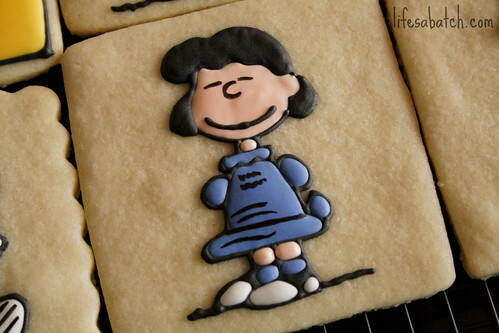 I loved Peanuts! In elementary school, I had tons of books, an autograph book, a book bag, etc… and loved to draw them. 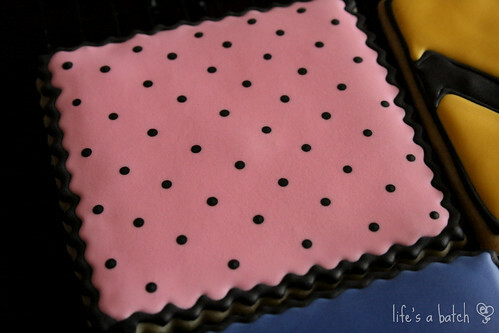 The cookies turned out perfectly adorable! Thank you, Sue! We read the heck out of those poor ol’ paperback books, and I could recite sections of the comics. Loved them! 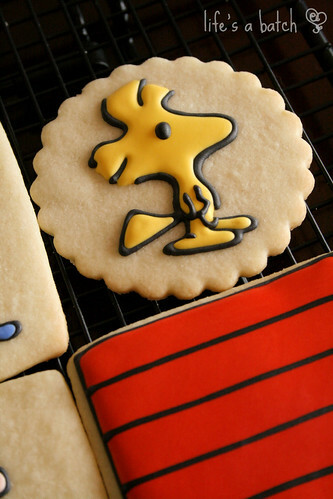 Nicole these are all the cutest and most fabulous collection of Snoopy cookies EVER! These are amazingly adorable and just perfect! Thank you, Glory! I’m so glad you stopped by! 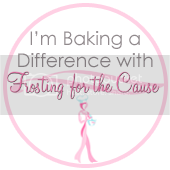 I found your blog through it’s mention in Be the Mom… your cookies are amazing! You are an artist! Wow! Just wow! Only one problem… I don’t think I could bring myself to eat your cookies. They are just too darn awesome! Those cookies are awesome. Do you sell them? 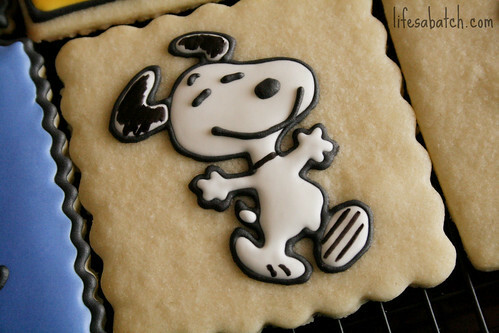 Do you sell /ship Snoopy/Peanut gang cookies? 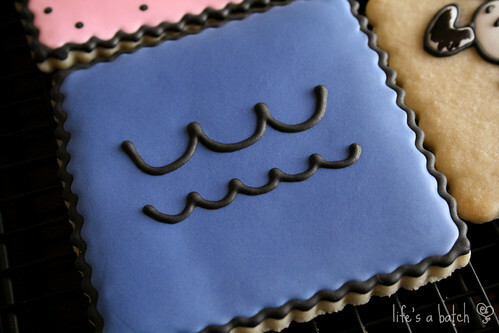 I know someplace in Texas where all these cute cookies could be put to good use! Seriously let me know.! I do, Susan! And I’m in Texas, even! 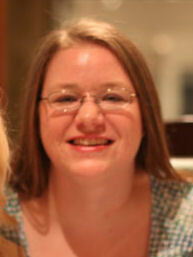 Hi Nicole! I’m Amapro form Manila, Philippines. I was browsing for Charlie and his woodstocks friends design ideas for my daughter’s 4th birthday. 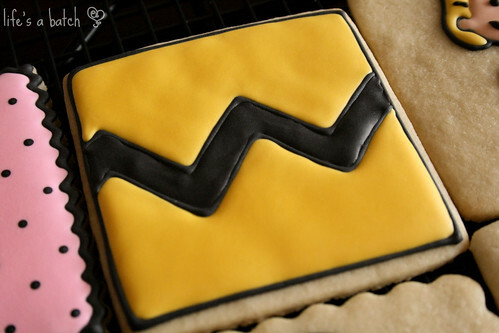 I came across your website and found these amazing cookies. Please, I would like to ask your help to make them too. They would make my daughter really happy. Thanks very much! Hi Amparo! 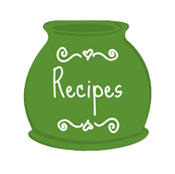 You can send me an email – nicole@lifesabatch.com – for order requests. Please be sure to include the date of your event in the subject line of your email. Thanks so much!